On Feb. 14, the universal Church honors two brothers, Sts. 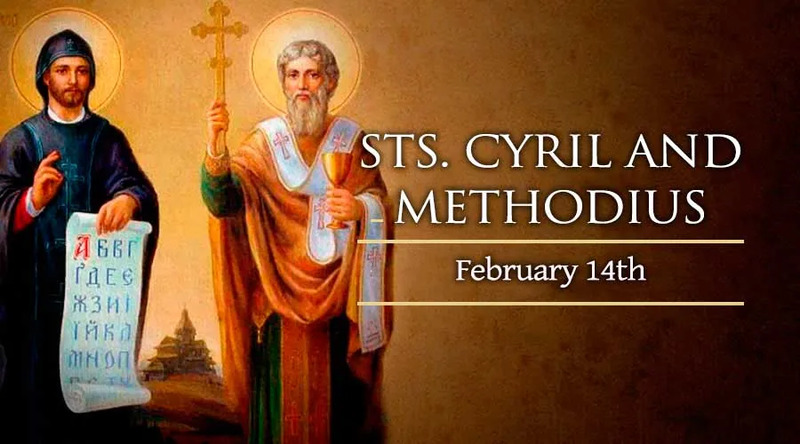 Cyril and Methodius, who are called the “Apostles of the Slavs” for their tireless work in spreading the Gospel throughout Eastern Europe in the ninth century. Such was their influence in Church history, through their evangelization efforts, that the late Pope John Paul II named the two brothers the patron saints of Europe along with fifth century monastic leader St. Benedict. Born into a prestigious senatorial family in Thessalonica, in 827 and 826 respectively, Sts. Cyril and Methodius renounced their wealth and status. They chose instead to become priests. Both were living in a monastery on the Bosporus – now known as the Istanbul strait which separates Europe and Asia – when the authorities from the Khazar Empire sent to Constantinople for a Christian missionary. Cyril was chosen and was accompanied by his brother. Both learned the Khazar language and converted many of the people. Soon after the Khazar mission, there was a request from officials in Moravia – a region in the present-day Czech Republic – for missionaries who could preach and celebrate liturgical services in the local dialect. Although German missionaries had already labored among the people for some time, they had little success. In order to fulfill this mission, Cyril and Methodius took the step of adapting the Greek alphabet into a script for the Slavonic language. The result was the “Cyrillic” alphabet, which was first used to translate the Bible and liturgical books. It also became the primary means of written communication for large portions of the world, including modern day Russia. The two labored in Moravia for four years until 868, achieving greater success than the German missionaries. Their Byzantine origins and use of the vernacular language caused some German church officials to regard them with suspicion. However, after being summoned to Rome they met with Pope Adrian II who warmly approved of their methods. Cyril and Methodius were commended by the pope for their missionary activity and ordained bishops. Yet Cyril would not return to Moravia, and died in Rome in 869. In order to further Methodius' work in Moravia, Pope Adrian II appointed him archbishop of a new archdiocese in the territory, independent from the German church. Unfortunately this had the effect of angering his German critics, who had him deposed and imprisoned for a period of three years. Pope Adrian's successor, John VIII, managed to have Methodius freed and had him reinstated as archbishop, after which he expanded his work to incorporate the region of modern day Poland. The new Pope continued to support Methodius' use of the Slavic languages in worship and his translations of the Bible, despite continuing controversy with some elements of the German church. Eventually, with the assistance of several Greek priests, he translated the whole Bible into the language that is known today as Church Slavonic. He chose his successor from among the native Moravian Slavs whom he had evangelized, and died on April 6 in 885. Sts. Cyril and Methodius' missionary work among the Slavs laid the essential foundation for the later Christianization of Ukraine and Russia in 988, when the Russian Prince Vladimir accepted Baptism.